The Rye library invites ages 5 and up to watch “Puss in Boots” (PG), Friday from 3:30-5 p.m. 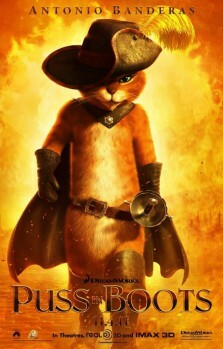 Taking the old fairy tale a step farther, the animated movie has the clever feline trying to clear his name from charges making him a wanted fugitive. Lots of nursery rhyme characters show up in this cinematic romp. Join Rye Rec for an evening of sporty fun, Friday from 7-8:45 p.m. Cost is $15 for residents, $20 non-residents. Pre-registration is required; call 967-2535. Join master falconer Jim Eyring at Read Sanctuary to learn about the natural history of these majestic birds and view them up close, Saturday at 1 p.m. Co-sponsored by Friends of Read. Bring work gloves and help beautify Marshlands Conservancy’s preserve Saturday from 1-3 p.m.
Ages 6-9 will learn how to make their dreams into stories in a spontaneous and fun fashion, Saturday from 1:30-3:30 p.m. at the Rye Arts Center. Participants will learn how to share, cast, and direct their dreams, and bring them to life. Parents are welcome to attend. The fee is $35. Luis Quiros, author of “An Other’s Mind”, will give a talk at the Rye library, Saturday at 2 p.m. In his book, Mr. Quiros, who is of Puerto Rican descent, delves into what it is like to be an “other”, struggling outside the mainstream of American culture and expectation. Only by understanding each other’s perceptions, he says, can we reach greater accord and become a truly united nation. Professor Quiros teaches at Fordham University and is a community organizer and advocate. For more information, call 231-3161. “Spirit Speaks — Are You Listening” by Valerie Croce Stiehl depicts the author’s transformative spiritual journey, her near-death experience, and the ten years she spent living with the Lakota Sioux in South Dakota. Meet the author at Wainwright House Saturday from 3-5 p.m.
Books are available for sale and signing. Cost is $25. Pre-registration is required, call 967-6080. Ms. Stiehl will also hold a retreat weekend May 5 and 6. The Rye Arts Center invites adults and teens to learn how to achieve the look of various textures — from pearls to porcelain — in paint, Sunday from 9 a.m.-4 p.m. An instructor will guide you through the handling of values, edges, color, and paint application. Call 967-0700 for a supply list. The cost is $135. Enjoy the Ron McClure Trio and brunch at Wainwright House Sunday from 12-3 p.m. The event will be catered by Corner Stone. Cost is $35 per person. Reservations are required; call 967-6080. The Osborn Retirement Community and the Rye City Lions Club are partnering again to collect unneeded eyeglasses for recycling. Donations will be collected every Tuesday from 10 a.m.-4 p.m. at Miriam’s Attic, The Osborn’s Resale Shop. The Lions Club will deliver the eyeglasses to New Eyes for the Needy, a non-profit, non-sectarian volunteer organization in Short Hills, New Jersey. The glasses are sorted by adult and student volunteers and then distributed free of charge to several hundred thousand poor and under-privileged people in developing countries around the world. The organization also purchases new eyeglasses for children and adults in the United States and distributes them in partnership with social service agencies and optical dispensers. On March 31, at its annual fundraiser, the Rye Arts Center will honor longtime Rye resident Barbara Elliot. The event will be held at Old Oaks Country Club in Purchase. The celebration begins at 6:30 p.m.
Ms. Elliot, a professional arts educator, recently retired from the RAC Board of Directors after 20 years. During her tenure, she served as co-chair of the Patron Committee, Wall Campaign, and for a decade, the Gallery Committee, encouraging quality exhibitions here and in surrounding communities. Exhibitions featured works of local collectors and artists (“Birds, Beasts and Samurai: Japanese Art and Armor”, artists of Kirby Lane North, and annual regional exhibitions featuring members of Ground Glass Photo Club and Teaching Artists shows). Thousands of children and adults have delighted in the popular Painters on Location and Kids Focus events, both initiated by Ms. Elliot and her talented Gallery Committee. As a dedicated volunteer, she has inspired thousands of students, docents, and gallery visitors to enjoy art. The gala features an art exhibition, cabaret concert, and premiere of “Celebrate the Arts”, a specially commissioned video produced by Tony Coash which focuses on the center’s extraordinary classes and programs. The event will also salute RAC’s talented instructors and staff. To purchase tickets, visit ryeartscenter.org, call 967-0700, ext. 33, or email marketing@ryeartscenter.org. Cheer on the Rye Y’s Strong Kids Campaign March 31 from 7 to 11 p.m. at Manursing Island Club. Enjoy the live action of Final Four college games on High-Def TV’s and try your own hand at “pop a shot” competitions to earn “top Pop” bragging rights. Attendees are asked to pull out their favorite college baseball cap, T-shirt, or sports gear, as dress is collegiate-casual. Festive school spirit required. Proceeds go to the “Y Cares” financial assistance program. In 2011, the Y awarded over $450,000 in scholarships to families, ensuring that all may benefit from its facilities and programs, regardless of economic circumstance. For event details, to purchase tickets, view auction items, and sponsor ads visit ryeymarchmadness.org. Tickets are $150 each. Executive and Career Coach Arjan Eenkema van Dijk will share tips and techniques for launching a proactive job search at the next Lives in Transition meeting, March 15 from 7-9 p.m. at Rye Presbyterian Church. RSVP to livesintransition@gmail.com. Learn to prepare Gnocchi a Parisienne, (herb gnocchi) at La Panetière March 16 at 11:30 a.m. A three-course luncheon will follow the demonstration. The cost is $40 per person plus beverage, tax, and gratuity. For more information, call 967-8140. Restore your balance with nature at a fire drumming ceremony March 18 from 6-7:30 p.m. at Wainwright House. For reservations, call 967-6080. At the next “Heard in Rye” workshop, Jordan Burnham will give a talk on “Emotional and Mental Wellness Among Teens and Young Adults”. The program will be held March 21 at 7:30 p.m. in the Rye Middle School Multipurpose Room. Mr. Burnham shares his story of struggling with depression and hiding his internal pain as a teen. In high school, he had everything to live for. He was popular, had good grades, and was a star athlete. But as the pressures mounted, he attempted to take his own life during his senior year. Jordan Burnham’s miraculous survival propelled him to begin to deal with his depression and learn healthier coping mechanisms. Listen to storytellers spin good yarns, while enjoying Irish soda bread, cheese, and tea at the Rye library March 25 at 2 p.m. Patrick A. Ahern, a longtime Rye resident, who was born and grew up in County Limerick, returns to the library for the fifth year to reminisce about his youth. Joining him are Marianne McShane, a noted storyteller who delights audiences with folktales drawn from her own roots in Northern Ireland, and Dennis Winter, who will share his remembrances of All Ireland Pennywhistle Champ Miko Russell. The program is presented by the Rye Storytellers’ Guild. For more information, call 231-3161. The Jay Heritage Center invites all to its annual John Jay Lecture, March 25 from 3-5 p.m. This year’s speaker is Paul Finkelman, President William McKinley Distinguished Professor of Law and Public Policy and Senior Fellow in the Government Law Center at Albany Law School. His topic is “Jay Is for Justice: From Slaveholders to Abolitionists, the Jay Family and Racial Justice”. Professor Finkelman is an expert on slavery, freedom of expression, and constitutional law and history. His scholarship on religious liberty and on firearms regulation has been cited by the U.S. Supreme Court. He was the chief expert witness in the successful challenge to the Alabama Ten Commandments monument and in the law suit over the ownership of Barry Bonds 73rd home run ball. The talk is co-sponsored by Pace University School of Law, the Jay Heritage Center, and the NY City Bar Association. For more information, call 698-9275. The Rye library is offering a workshop on Desktop Publishing March 27 from 10 a.m.-12 p.m. Seating is limited to 12, and there is no pre-registration. Best-selling author Andrew Gross will talk about his recently thriller, “Eyes Wide Open” at the Harrison Library March 28 at 7 p.m. The gripping novel is based on two real-life experiences, the tragic loss of his nephew and a chance encounter years before with the nation’s most notorious cult killer. Mr. Gross, a Purchase resident, will also give a sneak preview of about his forthcoming novel, a wild tale based on a book tour (his own) gone crazily wrong, which will be published in July. Mr. Gross is the author of “Blue Zone”, “Don’t Look Twice”, “Reckless”, and “Dark Tide”. He is also co-author of several No. 1 bestsellers with James Patterson, including “Judge & Jury” and “Lifeguard”. Books will be available for purchase and signing. The Rye Arts Center invites you to an iPhoto primer March 17 from 12:30-2:30 p.m. Learn how to organize precious memories and maintain a photo archive for years to come. The fee is $35. Call 967-0700. The Westchester Chamber Music Society presents a concert by Les Amies, trio for flute, viola, and harp, March 18 at 8 p.m. at Congregation Emanu-el. The trio is comprised of world-renowned flutist Carol Wincenc and Philharmonic Principal players Nany Allen, harp, and Cynthia Phelps, viola. Tickets are $35, free for students. For more information, call 967-7399. “Oil to Ink”, an exhibit of work by Lexi Hart, is on display through March 29. The collection includes watercolor paintings, oil portraits, comic strips, and cartoons. Hart studied painting in Spain, Italy, and most recently, at the Art Students League of New York. She has been the cartoonist for The Rye Record since 2009. “Mix and Match”, artwork by Marion Levy, will hang in the Children’s Room Corridor for the month of March. Levy, who is 93, has been working in one medium or another for most of her life. Grades 9-12 can enjoy basketball, swimming (swim caps required), working out, video games, air hockey, ping-pong, and socializing with friends March 9 and 16 from 7-10 p.m. At Middle school teen night the popular Velcro Wall is back March 10 and 17 from 7-10 p.m. Admission is free for members, $5 for Teen Access members. Celebrate the luck of the Irish at the Square House March 17 from 1-3 p.m. Ages 7-11 can enjoy a festive afternoon baking traditional Irish Soda Bread, creating their very own pot of gold, painting shamrocks, and other fun activities honoring the patron saint of Ireland. The cost is $15 per child and includes all materials. Reservations are suggested; call 967-7588. Ages 7-10 can learn the ancient art of Origami at the Rye Arts Center, March 17 from 2-3:30 p.m. Various designs and styles will be covered in this creative workshop. Fee is $25. Ages 7 and up can take part in the Rye Y’s open workout program March 22 from 6:30-7:30 p.m. Work on all four Olympic events, plus Tumble Trac and Mini Trampoline. Gymnastics experience is required. Cost is $20. Ages 5 and up can welcome spring at Fun Club March 23 at 3:30 p.m. at the Rye library. Enjoy stories about the new season and make a celebratory decoration. The Rye library invites ages 6 and up to create bird feeders for their backyards at a Project FeederWatch program March 24 at 2 p.m. Barbara Matthews of the Audubon Society will lead the youngsters in fashioning feeders from beverage cartons and tell them about the many varieties of wild birds they can expect to see come by for a snack. Participants should bring a clean half-gallon milk or juice carton. Space is limited; call 231-3162 to register. Learn about the Rye Nature Center’s very vocal neighbors March 23 from 6-7 p.m. Wear rain boots, as you’ll be adventuring near the pond. Cost is $5 for members, $8 non-members. Rye Y’s March Madness 3-on-3 Basketball Tournament (grades K-6) is set for March 25 from 1-6 p.m. Registration is ongoing at the Member Services Desk. Cost is $20 per child. Marshlands Conservancy is offering great programs this month that the whole family can enjoy. On March 18 at 7:30 p.m., join expert birder Tom Burke to view the woodcock’s dance and mating call. The same night, same time, bring binoculars and take in the breathtaking beauty of the night sky. Lend a hand and prepare the shoreline for nesting ospreys March 24 from 1-3 p.m. Bring work gloves; hand tools are provided. Learn about the shells on the preserve’s shoreline and who inhabited them March 25 at 2 p.m. The Milton School Spring Fair will spring into action Saturday March 31 from 10 a.m.-3 p.m. Come and enjoy Olympic-themed games, The Fun Bus, cake walk, bouncy castles, face-painting, arts and crafts, and food from around the world. Take part in an Old-Fashioned Easter Egg Hunt at The Osborn, April 7 at 11 a.m. The Easter Bunny promises to join you on the South Lawn, along with residents, staff, and their families. Bring a basket to collect candy-filled eggs. For those who want to picnic on the front lawn and don’t want to bring food from home, you can purchase a quick lunch (hot dog, drink, and chips) for $3. For more information, call 925-8200. Looking for Parkway Light– Not My Job?